"We most definitely need a non-copper control. Copper builds up in the soil and makes a very toxic growing environment that lasts for decades. I don't think I can over-stress the problem that canker is causing in Florida groves. Although it's still very early in the season, to date I have had more fruit drop from canker than I have from HLB [citrus greening]." After previous introductions and eradication efforts, citrus canker was re-introduced to Florida in 1995. A $1.3 billion eradication effort was abandoned in 2006 after hurricanes spread the disease throughout the state. A major management tool for the disease is the use of copper sprays, but these compounds result in adverse environmental impacts, and widespread use of copper inevitably results in the development of resistant strains. 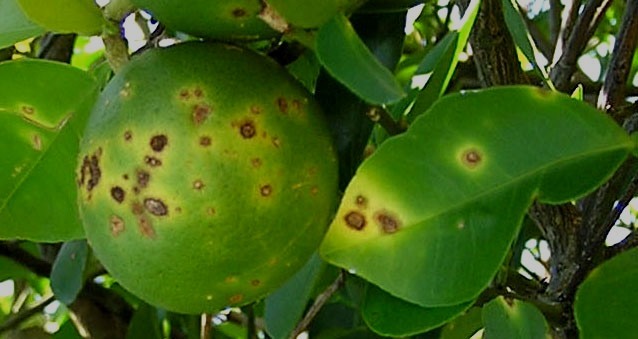 Citrus canker lesions on orange fruit and leaves. Photo by Dr. Jeff Jones. Genetic resistance is the ideal and most environmentally-sound solution to citrus canker. Given the difficulty and extremely long timelines of citrus breeding, a transgenic approach to resistance is attractive. However, resistance must be strong and durable to justify the cost of a transgenic approach and to last for the lifetime of a citrus tree. The best approach to ensure durability is to stack multiple sources of genetic resistance with different modes of action. 2Blades is working with researchers at UC Berkeley and the University of Florida to test in citrus multiple genetic approaches that are effective against other Xanthomonas pathogens. 1) We are expressing a nucleotide binding, leucine rich repeat protein (NLR) that induces defenses in response to a pathogen virulence factor (effector). NLR proteins are widespread in plants and serve as the main soldiers of the plant immune system. NLR-mediated resistance is generally strong though specific to a particular pathogen race. However this NLR detects a common and critical component of the bacterium, making it more broadly useful and potentially more durable. 2) We are testing two receptors that recognize common bacterial features called PAMPs for Pathogen Associated Molecular Patterns. Pattern recognition receptors are known to provide broad spectrum antibacterial resistance. 3) We are using gene-editing techniques to alter a susceptibility gene which is known to confer bacterial resistance in other plants. Shantharaj, D, Römer, P, Figueiredo, JFL, Minsavage, GV, Krönauer, C, Stall, RE, Moore, GA, Fisher, LC, Hu, Y, Horvath, D, Lahaye, T, and Jones, JB (2016). An engineered promoter driving expression of a microbial avirulence gene confers recognition of TAL effectors and reduces growth of diverse Xanthomonas strains in citrus. Mol Plant Pathol. DOI: 10.1111/mpp.12454. Moreira L, Almeida N, Potnis N, Digiampietri L, Adi S, Bortolossi J, da Silva AC, da Silva AM, de Moraes F, de Oliveira J, de Souza R, Facincani A, Ferraz A, Ferro M, Furlan L, Gimenez D, Jones J, Kitajima E, Laia M, Leite R, Nishiyama M, Rodrigues N, Nociti L, Norman D, Ostroski E, Pereira H, Staskawicz B, Tezza R, Ferro J, Vinatzer B, and Setubal J (2010). Novel insights into the genomic basis of citrus canker based on the genome sequences of two strains of Xanthomonas fuscans subsp. aurantifolii. BMC Genomics 11:238. doi: 10.1186/1471-2164-11-238.